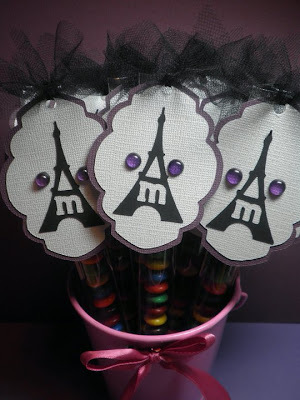 Today I am sharing with you the items I made for an Eiffel Tower birthday theme. 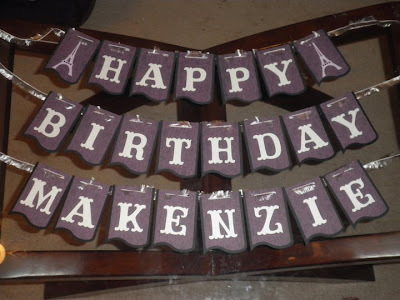 I was asked to make a banner, cupcake toppers and M&M sticks with purple, black and white. First I made the banner.. I used Birthday Bash and Storybook cricut cartridges. Next I created the cupcake toppers. 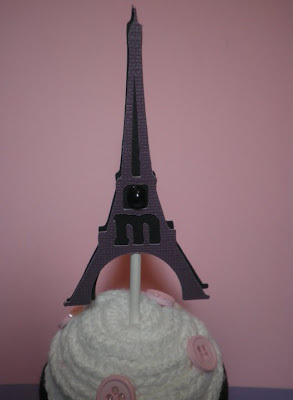 The Eiffel Tower was cut from Wall Decor and More and I modified it alittle bit by adding an M to be cut out of it. Then for the M&M sticks I used French manor and again modified the Eiffel Tower with an M.
I am going to have to scraplift this from you...We are re-decorating my daugher's room in the Paris theme, and her Birthday will be that as well...I have been trying to decide what I was going to do....This gives me a direction...thanks so much for sharing this. Wow.... Thank you so much Candice, I can't believe I won!!! I love your banner & cupcake toppers, so cute! I love them all! I love the cupcake toppers! Thank you for sharing all your ideas! Thanks for sharing these amazing ideas. i am new to your blog. candace how do u make the candy sticks. Yes can you tell me how you make the candy stick too. Your projects are so awesome.